As a follow up to my post of Three Bags Full I want to catch you up on my second class and what's happened since I posted about my drop spindle class. 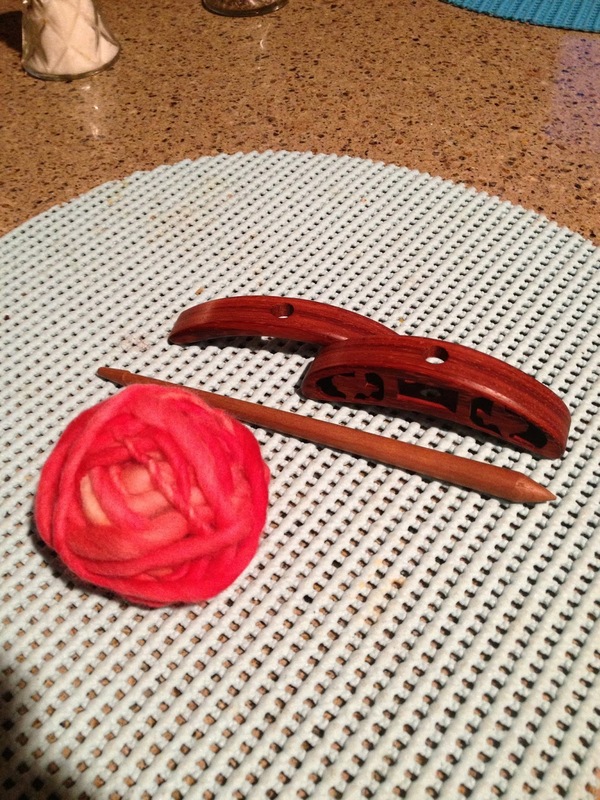 Which by the way I have continued to do some spinning with my Turkish spindle nearly every day! Impressive since I hadn't touched it in weeks prior to Katie's class. 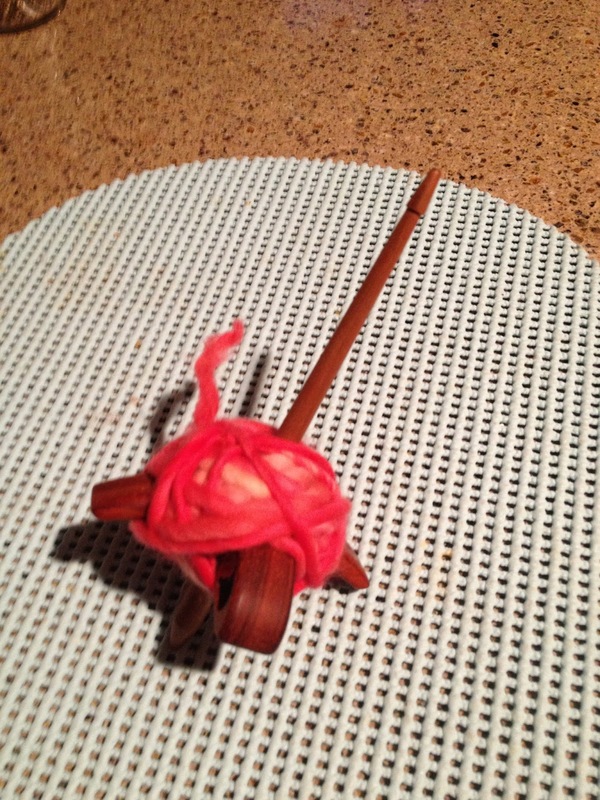 When you are finished spinning you take it apart and the yarn is in a ball. Pretty cool! but right now it's just not neat or perfect but it sure is fun! I don't have my drum carder yet, so I'm using some fiber from class, but once the carder gets here the three bags full will soon be batt and or roving - soon to be yarn! I think my problem will soon be what? it's all gone! 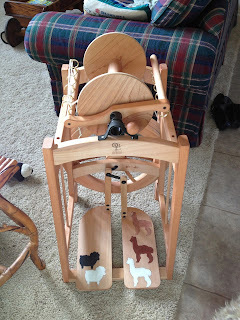 It's just so darn much fun to spin and it goes so fast, I just bet I'm looking for more fiber soon! Tomorrow I learn to dye fiber as well as make beautiful batts and spin, so if I dye my boys fiber, or at least part of it that will help slow down the process of it being spun too fast! 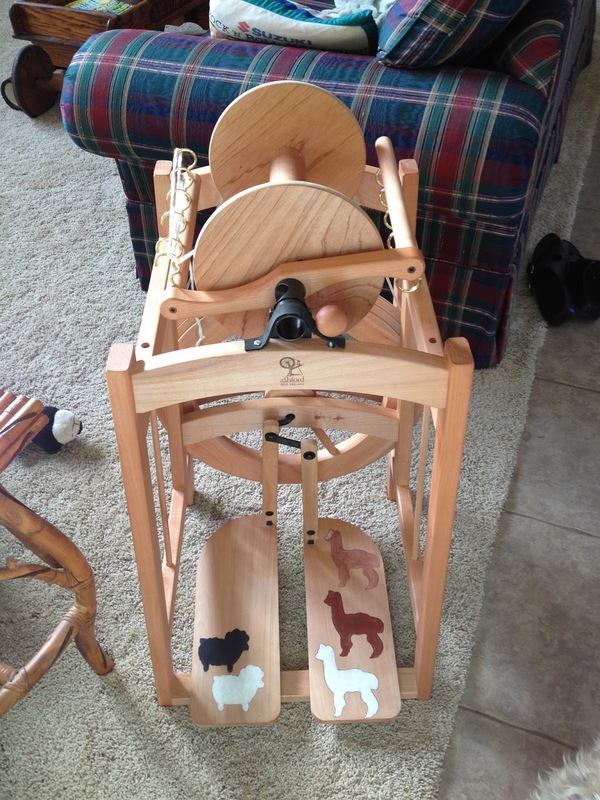 We take our wheel with us to classes and events, so I personalized mine with three alpacas and two sheep on the treadles. Can't wait for Stephanie to see it! I will take all of the yarn I've made this week in practice with me tomorrow and I think she will be surprised at how much I've done. So, now it's time to go get some more mowing done! Got my mower back today after two weeks, so much to do! Back after my class tomorrow with more fiber adventures! There's something I'm learning about a blog and, that is, that you can put things out there before it's their time! For instance, I showed my picture of my flower pots and I was pleased! I told you how much fun I had painting it and well, I believe I sounded a little proud! Then yesterday I looked at it and thought about how flat it was. It had a back drop rather than a table and I spent the better part of the day trying to figure this out. I posted it on my class FB page and ask for help. 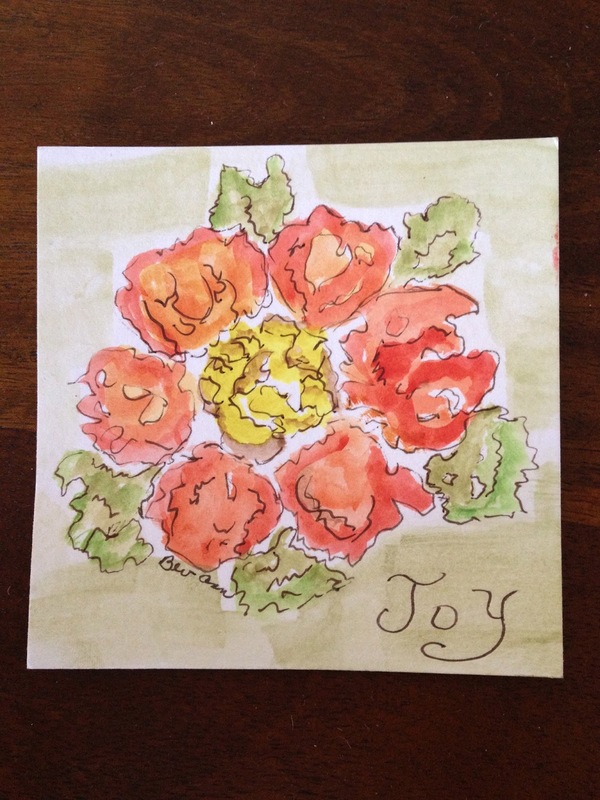 I texted it to a dear friend who is an artist and begged for help. I got responses from everyone, but finally I set some items on my kitchen counter along with some utensils and sat on a stool in front of them. I was low enough to look straight on, like the picture and I saw the problem. The table was too big - it had turned into a wall! lol So, I made a color photocopy and practiced on it. As soon as I made the table smaller, the problem was solved. Or at least that problem. Once I posted the copy, I had ladies point out that shadows were in the wrong place and so I corrected that on the original, but not on the copy. I actually had thought I might just leave the original alone - I didn't know how much more paint that poor piece of paper could stand, but got home from a meeting last night and had to fix it before I could even think about sleeping. So here they are: the first attempt, the one I posted on Tuesday, the copy and the final original work now changed. I'm finished with it! 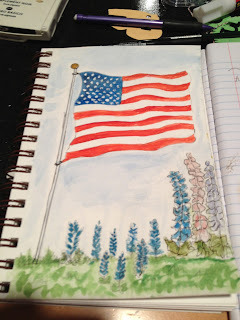 (I hope) I know I could keep working on it forever, but it's time to get back to some wildflowers and some of the other projects Junelle has given us to work on. Posting these pictures today I'm much more humble! 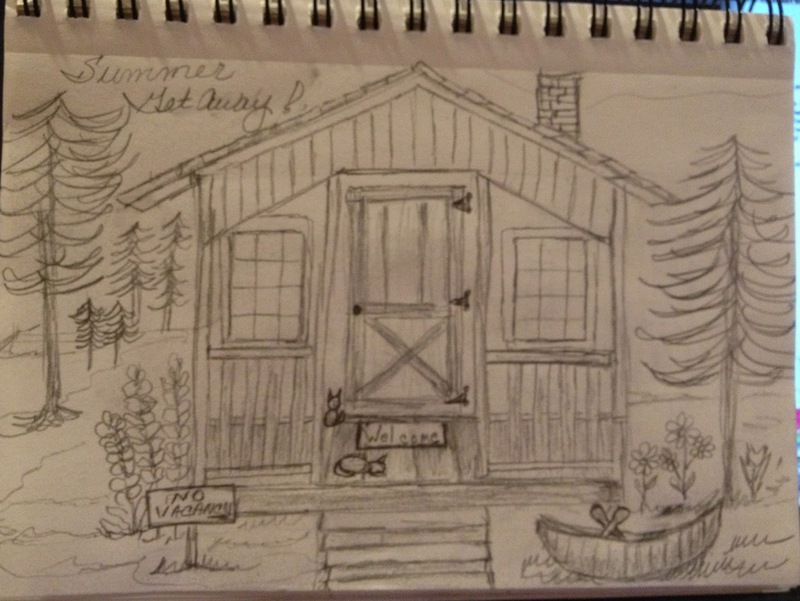 Yes, it was fun, but, it was lots of work and I've learned just how much I need to learn! And when I learn more, I will realize how much more there is to learn! I love that - no matter how much you learn, there's always more! That is one of God's greatest gifts! 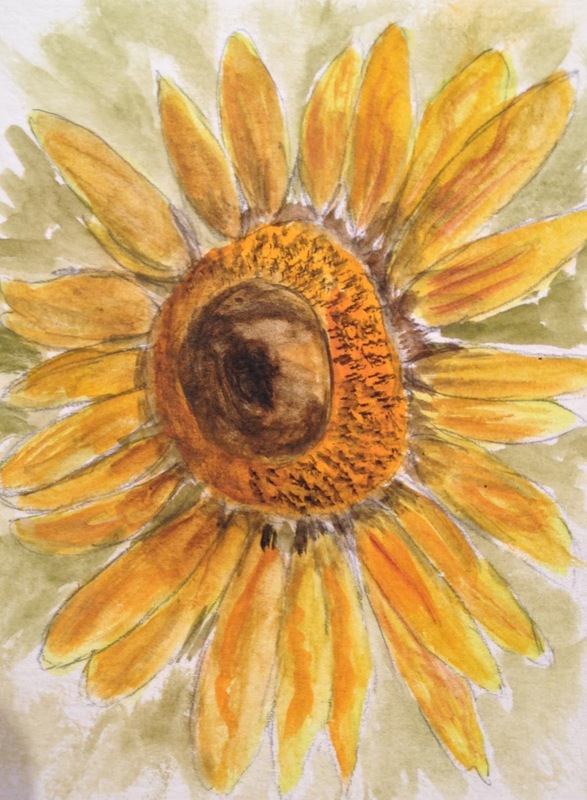 This week has been a good one with my wildflower summer class - lots of fun sketching ideas and the talent of the other ladies is just amazing. So much to learn from Junelle and my classmates. I started working on a piece over the weekend that just popped on to my paper. It really had nothing to do with the new class we had on Saturday! And I'm the queen of wanting to finish things quickly, but I didn't finish this until last night! It was strange how I picked up my pad and pencil and vegetables began to appear. I started with the bell pepper, followed by the banana pepper, jalapenos, tomatoes, onion and cilantro. Then yesterday as I thought about making salsa I realized I had left out the garlic and added it! This was really fun, but far off from the flowers and other ideas for class this week. We get a new video class every Saturday and a mid-week mini class on Wednesdays (tomorrow) and I've not been very good about following the lessons. I've done most of them, but I've really had to fight doing what I wanted, rather than the suggested. One of the girls in the class posted a picture as far off task as my veggies tonight ( chickens and a coop) and said, "Oh well, art happens!" I loved that - and I'm using it from now on! Today I was supposed to be working on a "market type scene" - there have been some wonderful ones posted on our class page and I did a preliminary sketch, but before I knew it I was sketching these pots! I spent the rest of the day going back and forth between the pots I loved doing and the "farmer's market" I needed to do. I finished both or at least most of the way, but the market picture is just merely ok and yet I want to keep working on the pots - just like I did the veggies - keep trying to make it better. The pots are watercolors, where the veggies were acrylics so there's a much different palate, but I just love them both and they were both so much fun. I still have much to do with this weeks assignments and to be truthful I still have things to do from the first three weeks. What I love about an online class is that you can go back long after the "class" is over and since people are always signing up you're never completely out of touch or feel like you're too far behind. 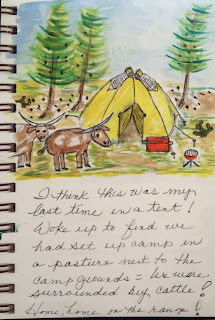 So here's my market picture - cute, but sure not as much fun as the pots or the veggies. I did really enjoy adding the little "woolies" as they made me smile! Love the woolies! Wish I could learn to draw alpacas, maybe I will practice so I can add one to my pictures! Many of you know that I've questioned my (our) decision to add alpacas to our life. I/we have gone back and forth since they arrived, but I'm happy to say that Thursday, July 11, almost 5 months since they arrived I knew in my heart they were our boys and were staying! Can't explain it, they're still feisty and nothing has really changed, I just knew! With that in mind I decided I needed to figure out what I was going to do with my three bags of fiber, before I had six bags of fiber! I know it's not until next May that more arrives, but the months are flying by and I know how easy it is to put things off so I made some plans. When I was in Oregon I used a drum carder to make some beautiful batts of fiber, so I knew that was the next step so I headed off to my favorite little wool store in Navasoto, WC Mercantile and spent Friday afternoon with Stephanie. She's the owner and she knows her equipment and fibers, so I had a fun and educational afternoon and four Saturdays of classes added to my schedule. 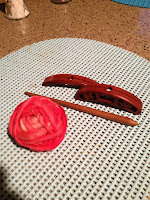 I started yesterday with a drop spindle class with her young teacher - Katie! I had met Katie at the fiber show in Seguin and she's a 21 year old wonder! She knows more about fiber and what to do with it and I was excited to take a class with her. She's the one that taught me how to use my hand carders while standing in a booth at a show in about 15 minutes!! That's a teacher. 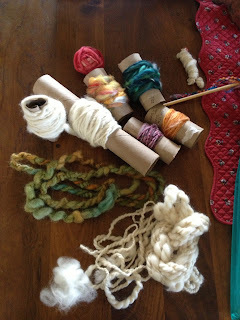 :) This class was a prerequisite for the class next week - Intro to Your Spinning Wheel. No I haven't bought one yet, but have two, yes two, picked out. I will be using them both at the class next week to determine which will be headed to Brazos Hill Lane in the near future! The third week is Art Yarn A_Z! 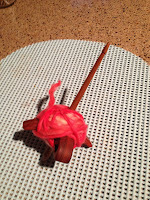 Creative Spinning: From Dye-pot to Bobbin! with Diana North. That's the big crazy yarn with all the goodies in it and I can't wait! The entire thought of carding this fun batt and then spinning it into this amazing weird yarn makes my heart race! This class will help me make my decision on my drum carder (type) and my first wheel, which I believe will be the Country Spinner. And the 4th week is with Katie again - this class is "Beginning Fiber Prep! Much of this I've learned at shearing or in Oregon, but I haven't washed fiber and I know I will learn much that will help me use my three bags full! So, here's two pictures of my new sleeve - I added black felt letters JAVA to the sleeve and forgot to take a picture before I felted the ends together! This was quick and easy to make and it works great! 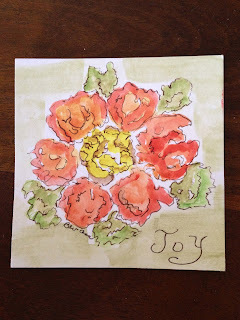 Going to make more of these - if you would like to have one, drop me a note or leave a comment. We'll see what happens! Be back soon - with fiber and spinning stories! 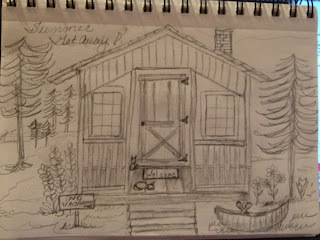 I've been quiet on my blog because I've been so busy with an online art class. Junelle Jacobson's Wildflower - Wild Art Summer and it is a blast. 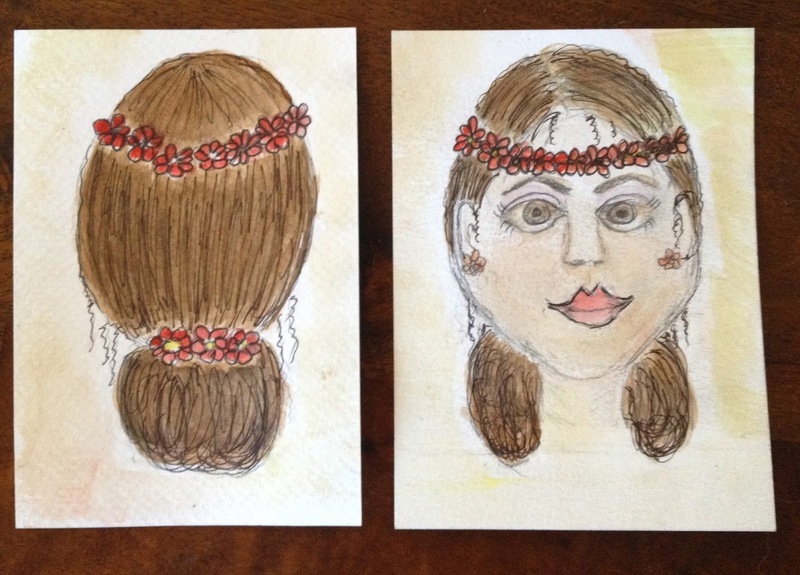 Covering all of the things I love so much: watercolors, acrylics, flowers, faces and photography! And the talent in my fellow classmates is just amazing! One thing I know for sure is that the more I learn, the more I know I need to learn. 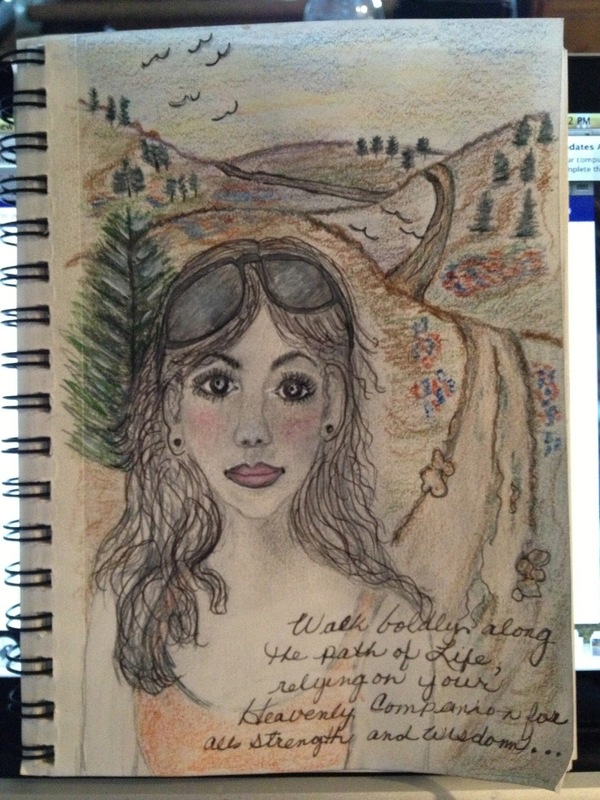 This week has been with Alissa Millsap and her instruction on a girl and a dirt path. 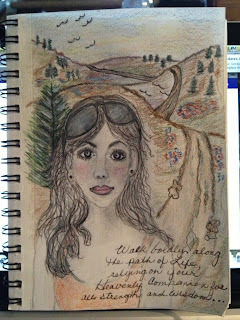 My interpretation is this girl I sketched with pencil in my sketchbook and then knowing I would never get her done again on WC paper, I just drew in the hills and the path and journaled! But, I did learn so much from Alissa's videos and instructions that I can't wait to begin another girl following the instructions and on the proper paper - perhaps tomorrow. We've done campers and tents! 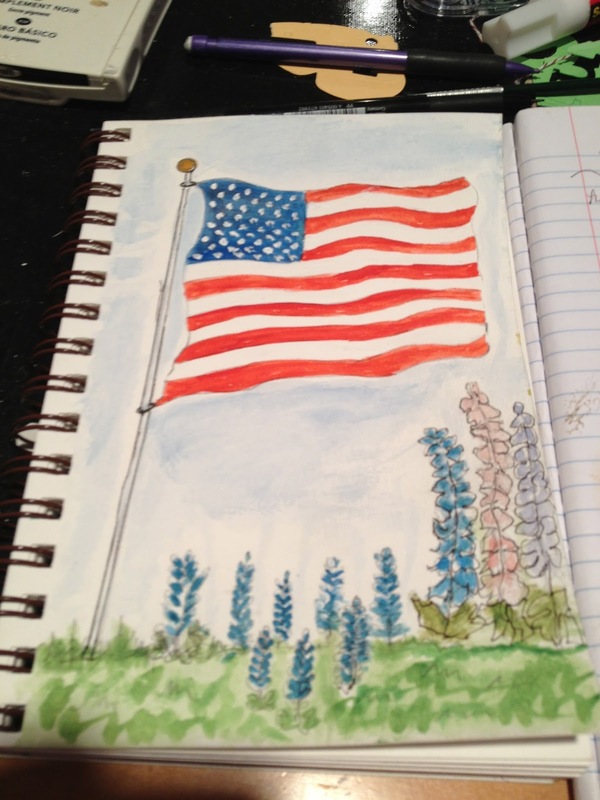 Flowers, even a girl with flowers in her hair, a flag with flowers on the fourth, followed by a cabin for a summer get away! Girl first week - I think I've learned a thing or two since then! But the best of all this is the joy found with the friendships with other artists from all over the world. They are inspiring and encouraging and are making this six weeks a summer to remember! But the big thanks goes to Junelle and Allisa for their hard work and desire to share their knowledge with those of us just beginning. Next week we're working with photographs Junelle had us take this week - can't wait to see what she's got planned!